Why choose Mat E at ISU? Why Choose MSE at ISU? Undergraduate & Graduate Admission – APPLY NOW! Abstract: Materials that can deliver outstanding harsh environment properties have been of high interest. In this talk, our recent activities on materials that can endure high temperatures or harsh nuclear environments will be presented. In the former, we have integrated theory and experiment to understand a new class of high temperature and ultrahigh surface area materials from polymer precursors–silicon oxycarbide (SiOC). Through molecular composition tuning, selective molecular species removal, and theoretical prediction, we have synthesized highly porous SiOC with single nanometer pores. We also demonstrated that the electrical conductivity of this new material can be orders of magnitude higher than the current dielectric SiOC. Another focus of our program is on SiC and ferritic alloy composites as nuclear claddings. We have developed different coatings on SiC and ferritic alloy particles respectively to address the reaction problems at high temperatures. Harsh environment corrosion resistance of these materials have been tested and analyzed based on fundamental materials science. Ion irradiation resistance of this material system will be presented. Lastly, our nanoparticle suspension casting process can pattern feature sizes across multiple length scales (250 nm to 10 µm). Nanoparticle-based sintering characterization using 3D microstructure reconstruction will be briefly introduced. Bio: Kathy Lu received her Ph.D. and M.S. in Materials Science and Engineering from Ohio State University and her B.S. in Ceramics from Tianjin University, China. Her research interest is in powder materials synthesis, forming, sintering; energy material design and processing; composites and porous materials processing and characterization. 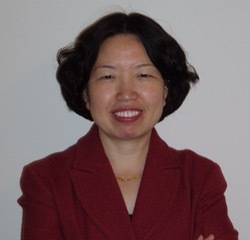 Since August 2004, Kathy Lu has been a professor in the Department of Materials Science and Engineering of Virginia Polytechnic Institute and State University. She has written >160 journal papers and two single-authored books. Kathy Lu is the recipient of 2017 Fellow of the American Ceramic Society, 2016 Virginia Tech Alumni Award for Research Excellence, 2012 Virginia Tech College of Engineering Faculty Fellow Award, 2011 Friedrich Wilhelm Bessel Research Award of Alexander von Humboldt Foundation, 2008 Karl Schwartzwalder-PACE Award of American Ceramic Society, and 2005 Ralph E. Powe Junior Faculty Enhancement Award of Oak Ridge Associated Universities.